It has been awhile since I shared what I am working on. I have a few WIPs. Right now I'm working on things I started through out the year and am just doing for the joy of stitching them for myself. First up - Charlotte by Mirabilia, or Charlie as I affectionately refer to her as. 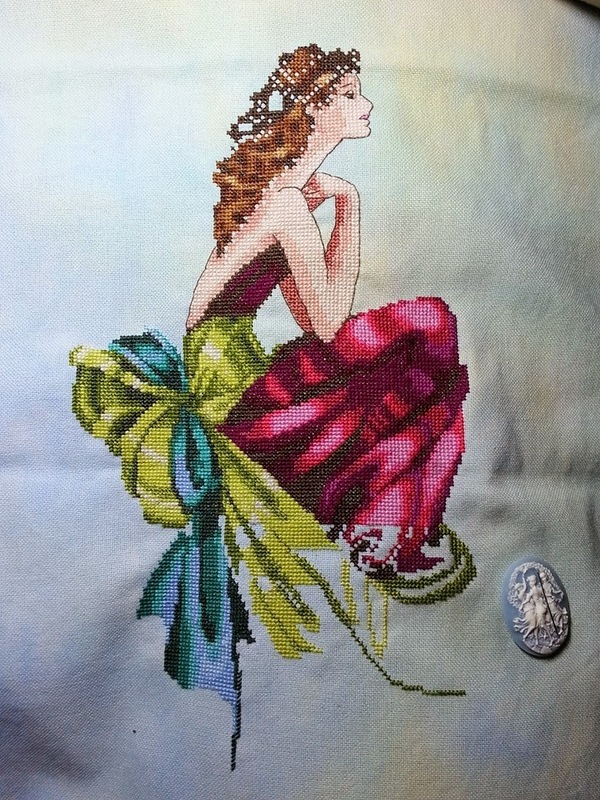 This is being stitched on 32 count Sunlit Pool by Crafty Kitten. I started her around September 1st, 2013. I needed an infusion of bright colours. I am still working away on her and work on her whenever I can. I have special treasures to put into her hair that I got at BeadFX - I can't wait to put them on! 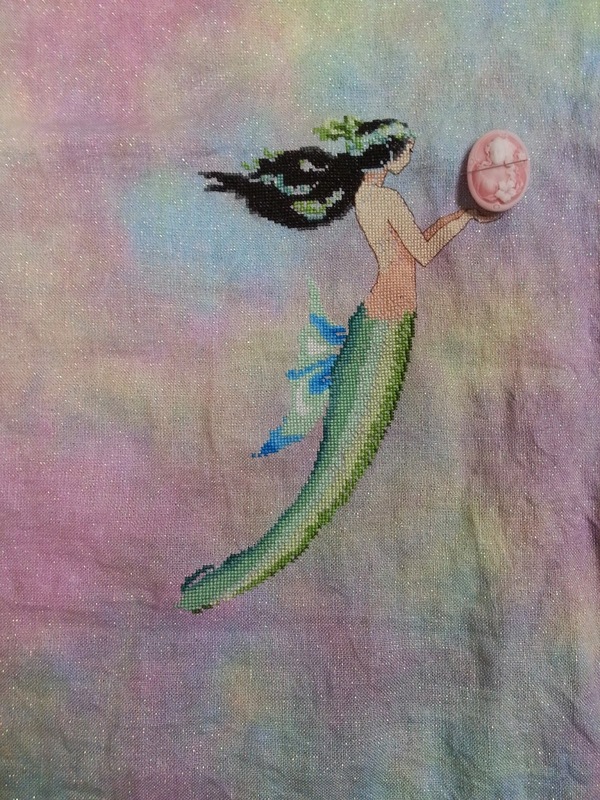 Before Charlie I was working on Mirabilia's June's Pearl Fairy. I started her on 28 count June 2012 Ltd Ed. Crafty Kitten. I started her on June 1st (get it June Fairy, on June Ltd Ed, on June 1st, 2013???) She has since become.... oh I hate to say it..... a UFO. At first I loved working on her - then the colour pallet got a little bland for me. That is why Charlie suddenly called to me. I would like to get back and finish her next year. 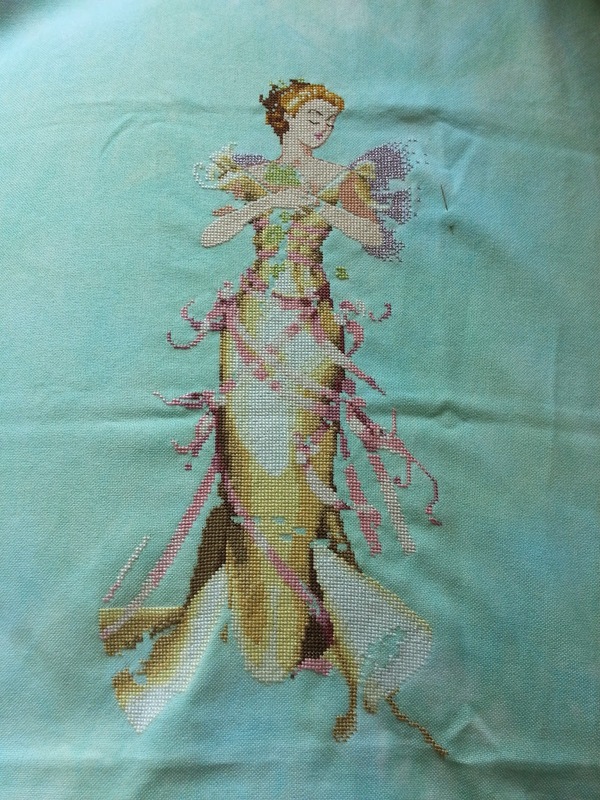 She is lovely and the beads are going to pop off this fabric. Finally, I have been working on my "Little Mermaid" Azure. She is being stitched on 32 opal Tropical Breeze by Crafty Kitten. She is a cute, fun stitch. I am fairly close to being done her as well. I started her on November 1st. The fabric and the colours are what motivated this start! I would really like to start the Seasonal Fairies by Nora some time in 2014. I have them all kitted and fabric chosen for each of them. My next project for myself is going to be The Frosty Forest by Country Cottage Needleworks. 10. Any new start I want when I feel like it! Looks like I better get cracking. Dare I say no new starts until 2014? Unlikely but a lofty goal!